Geoff Taylor has spent three decades building what he believes is a better microchip. Although silicon has powered an explosion in digital technology, Dr. Taylor is among the scientists who believe the chemical element is near the end of its shelf life. A native of Mississauga, Dr. Taylor has created a microchip at his laboratory at the University of Connecticut that is made of gallium arsenide (GaAs), a widely available chemical compound that the professor of electrical engineering and photonics says has shown a “10-to-1 advantage” in performance over silicon. With his invention nearly complete, his hope now is to draw attention and dollars from companies whose wealth has derived from the production of silicon chips. Dr. Taylor’s invention is owned by POET Technologies Inc., which changed its name from Opel Technologies Inc. in June. Based in Toronto and publicly traded on the Toronto Stock Exchange’s Venture Composite Index, POET was a multimillion-dollar solar company until last year, when it sold off its solar assets to focus on developing and selling Dr. Taylor’s chips. It has 15 employees, most of them at the Connecticut lab, and a market capitalization of $61-million. Led by its co-founder, Dr. Taylor, POET is preparing to approach industry-leading chip manufacturers in Silicon Valley this summer, and its pitch will be centred on the demise of silicon. “The only thing that would give them pause is the challenge of how do you mastermind it, and get your arms around it. It’s a challenge to have it move into place,” Dr. Taylor says of the technology, whose acronym stands for planar opto electronic technology, and which he sees as a successor to silicon microchips. 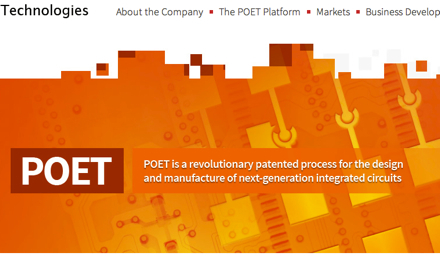 POET, the company, possesses more than 35 patents related to the technology, which makes it difficult for silicon behemoths Intel or IBM to duplicate. An aim for POET in the coming months is to find partners interested in purchasing or licensing Dr. Taylor’s semiconductor chips. However, persuading large businesses – let alone entire industries – to alter course is a gargantuan undertaking.